Nasa's Curiosity rover has ingested its first Martian soil sample. The robot has taken a pinch of dust into the CheMin instrument, one of its two big onboard analytical tools. It is a key moment for the $2.6bn mission - Curiosity's internal apparatus will play a central role in its investigation of the Red Planet. "The most important thing about our mobile laboratory is that it eats dirt - that's what we live on," chief scientist John Grotzinger told the BBC. CheMin provides definitive mineralogy – it uses X-ray diffraction to identify and quantify the minerals present in the rocky material that has been swallowed. Engineers received confirmation on Thursday that the sample was accepted by the instrument, and details of the analysis may be available as early as next week. The dust is the lightest and finest material the rover has been able to pick up with its scoop and system of sieves and sorting chambers. It should provide researchers with the broadest view of what makes up the soil covering the planet’s surface. The size of the grains – about a tenth of a millimetre in diameter, and smaller – makes them sufficiently tiny to be blown vast distances in the Martian wind. “These are particles that travel regionally, if not globally,” said Prof Grotzinger, who is affiliated to the California Institute of Technology (Caltech). “We see these globe-encircling dust storms and we believe that there are grains that are deposited uniformly all over Mars. Curiosity landed on the floor of Gale Crater, a huge depression on Mars' equator, on 6 August (GMT). Since then, it has rolled more than 480m (1,590ft) to the east to try to get to a location referred to as Glenelg, a place satellite images have indicated is an interesting junction between three different geological terrains. It is all but upon Glenelg now, but has paused in the drive these past two weeks to practise scooping and sorting soil samples on a patch of ground the rover team has nicknamed Rocknest. The robot needed to run material through its mechanism several times to scrub any residual Earthy contamination that may have been coating surfaces; and the sand and dust at Rocknest appeared to have the right properties for the job. On completion of this cleaning process, it became possible to deliver a sample for test in the CheMin (Chemistry & Mineralogy) tool, and subsequently, in the coming days, to the other big lab in Curiosity’s belly – Sam, or the Sample Analysis at Mars instrument. Sam will look for the presence of organics - carbon-rich molecules that may tell us something about the possibilities for life on the Red Planet both now and in the distant past. Engineers have been concerned at the number of small pieces of man-made debris they are seeing around the rover. These are likely bits of plastic that have fallen off the vehicle, or were deposited on to it by its landing crane and have since dropped to the ground during the drive. The team is not worried that these debris items indicate a major breakage on Curiosity; rather, the issue is that the objects could accidentally be picked up in the scoop and be ingested by the laboratories, seriously skewing their analyses. Engineers commanded the rover to dump one scoop when a bright fleck was seen during the dig. 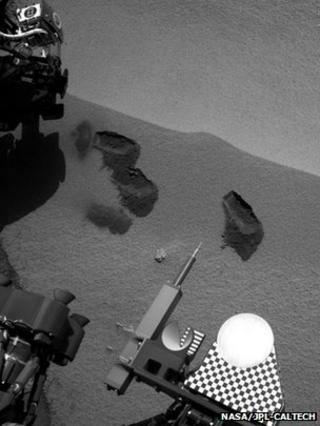 However, later imaging suggested this item was probably natural Martian material, and the scientists will now hit the 2mm-wide grain with the ChemCam laser spectrometer to probe its properties further and to work out why it appears so much brighter than all the material around it. Should we send humans to Mars? When will we send humans to Mars?